On Friday I promised that this week I would share the recipe for the apple cider caramel I included in my daughter's lunch. These little bites are absolutely amazing!! I suggest that if you decide to make these you have a plan of who you are going to give some to. Otherwise they will all be going to your thighs…true story! 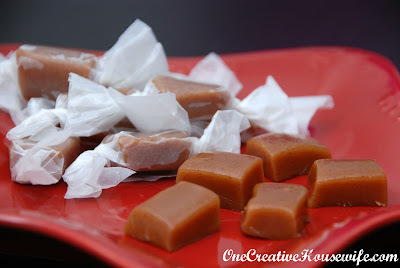 These caramels are time consuming to make, but they are totally worth it. 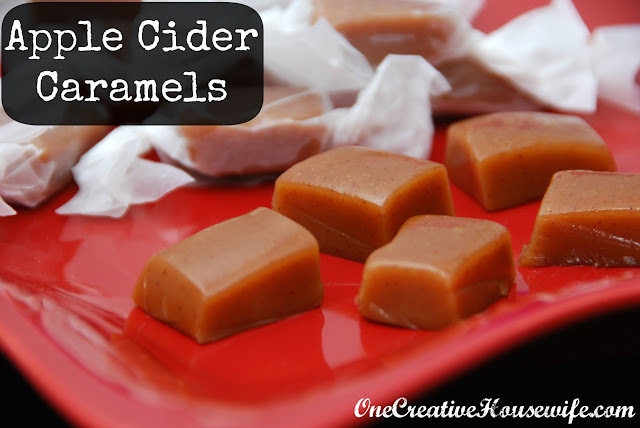 I made these a few times last fall, and I have already made them 3 times this year. Everyone I give these to loves them! Plus they last in the refrigerator for about 2 weeks, although I highly doubt they will stick around that long. The pictures in this post are from a double batch where I used an 11"x15" pan instead of and 8" square pan. **You can use 1 teaspoon apple pie or pumpkin pie spice + 1/2 teaspoon cinnamon in place of the cinnamon, nutmeg, and allspice in the recipe. You will need a candy thermometer. 1. Pour the cider into a small saucepan and boil on medium-high until the cider is reduced to 1/3 cup. This takes around 20 minutes. Keep a measuring cup close by so you can pour the cider in to it and check how much it has reduced. Once the cider is reduced to 1/3 cup, set it aside to cool. 2. 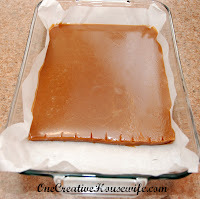 Line an 8" square pan with parchment paper, allowing it to hang over the sides (to allow for easy removal). Spray the parchment paper with cooking spray, and set the pan aside. 3. In a small bowl, combine 2/3 cup cream, cinnamon, nutmeg, allspice, and the reduced apple cider. Set mixture aside. 4. In a large saucepan, combine 1/3 cup cream + enough water to reach the 1/2 cup line on the measuring cup, sugar, and corn syrup. 5. 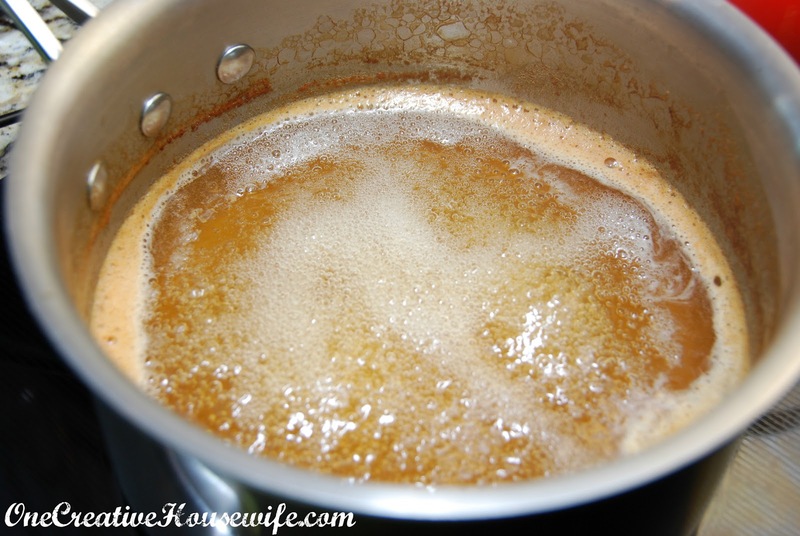 Cook the sugar mixture over low heat until all the sugar dissolves. 7. 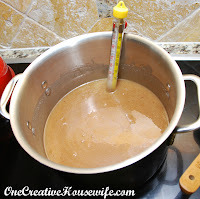 Once the syrup reaches 234 degrees, remove your saucepan from the heat and remove the candy thermometer. Then slowly whisk in the cream/apple cider mixture. 8. Add the cubed butter and stir until the butter and cream mixture are fully incorporated. 9. Return the pan to the heat and re-insert the candy thermometer. 11. Remove the pan from the heat, and pour the caramel into the prepared pan. 12. Let the mixture cool completely at room temperature or in the refrigerator. 13. 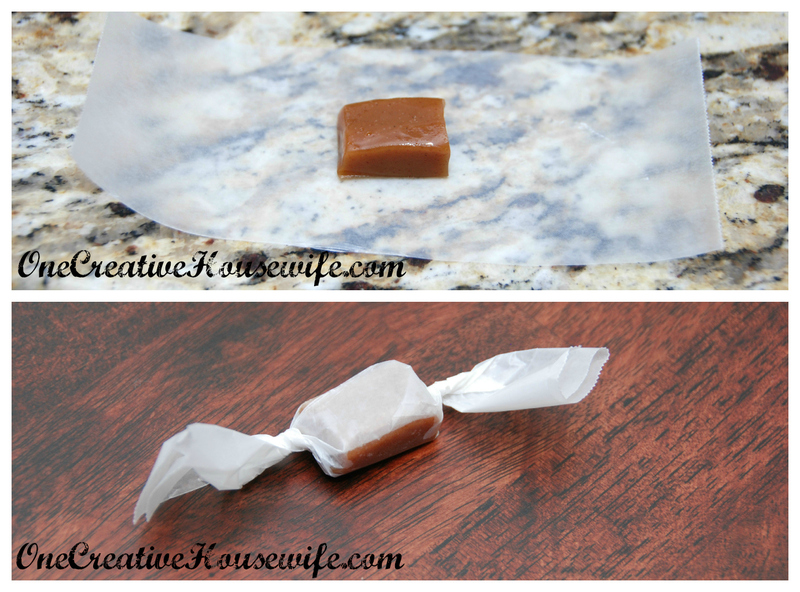 Cut the caramels into small squares or 8" logs, and wrap in wax paper. Like little tootsie rolls. 14. Store in an airtight container in the refrigerator for up to 2 weeks. 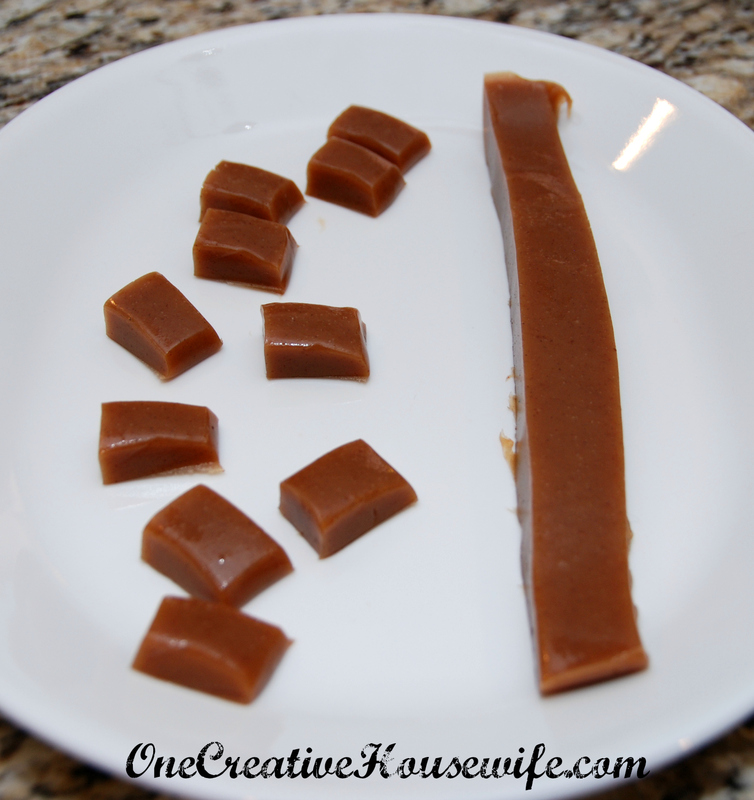 The caramels will be hard when you remove them from the refrigerator, but will quickly return to being soft when at room temperature. I'll Be Linking Up At These Parties! I pinned this---sounds so tasty! Thanks! Thanks and Thanks for stopping by! !